Khalid Al Balooshi drove to his first victory of the season and fourth of his career Sunday during the NHRA Pro Mod Drag Racing Series Thunder Valley Nationals at Bristol Dragway. This weekend’s Pro Mod racing was the sixth of 12 events this season. 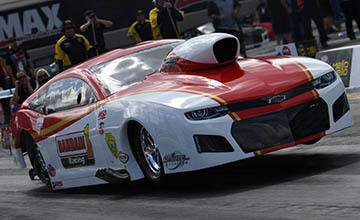 Al Balooshi used a 5.924-second pass at 247.38 mph in his Bahrain ‘17 Chevy Camaro to take down Todd Tutterow in the finals. Tutterow notched his first final round of the appearance of 2018 as his 5.948 at 242.10 was not enough to defeat Al Balooshi. Al Balooshi jumps up to third in the Pro Mod standings with the victory, while Tutterow now sits in eighth. Mike Janis retains his points lead in the class by following up his victory in Richmond with a semifinal exit in Bristol.